Are you a traveler who want to discover about Da Nang’s culture and history? Or are you looking for outdoor activities since you want to spend time being close to the nature? If so, we recommend you to visit the Marble Mountains, where you can find ancient culture in the majestic beauty of nature. 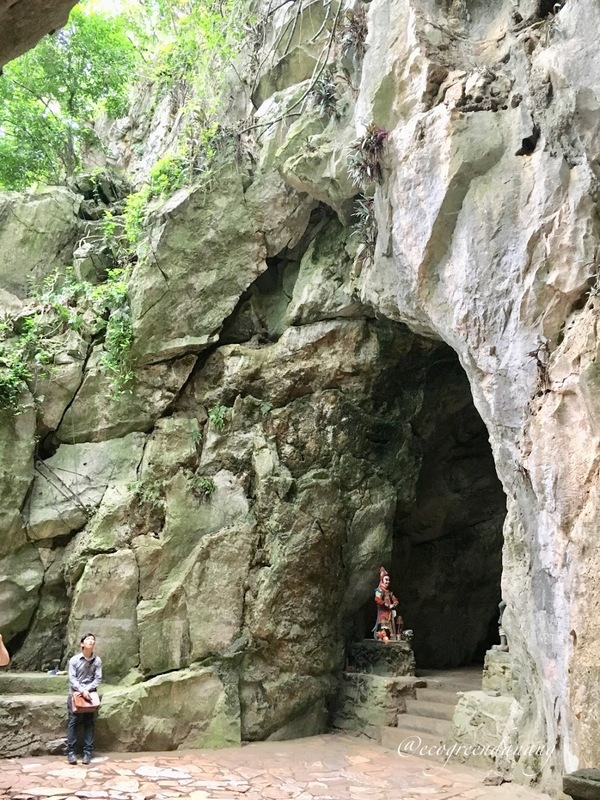 The Marble Mountains is a collection of five limestone mountains and named after the five elements: Kim (metal), Thuỷ (water), Mộc (wood), Hoả (fire) and Thổ (earth). These rocky mountains comprise of pagodas, caves, and shrines dedicated to Buddha. 1. How to get to the Marble Mountains from Eco Green Boutique Hotel? 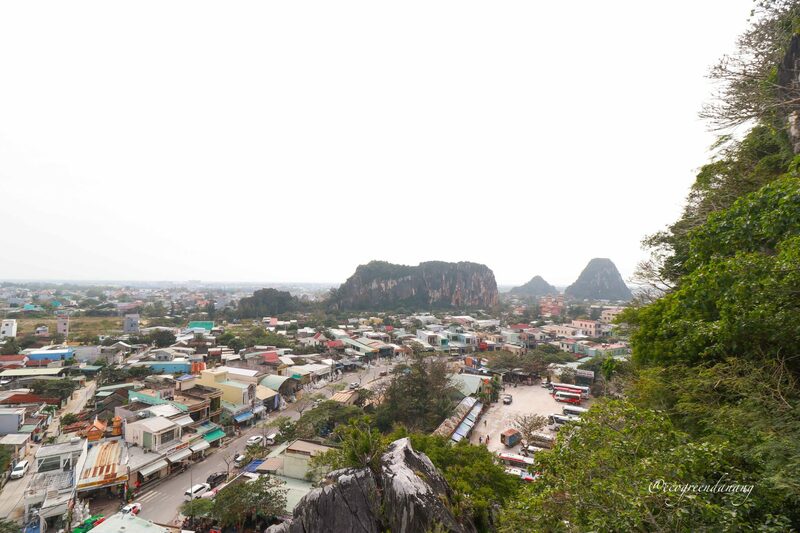 The Marble Mountains is 6.4 kilometers away from Eco Green Boutique Hotel. 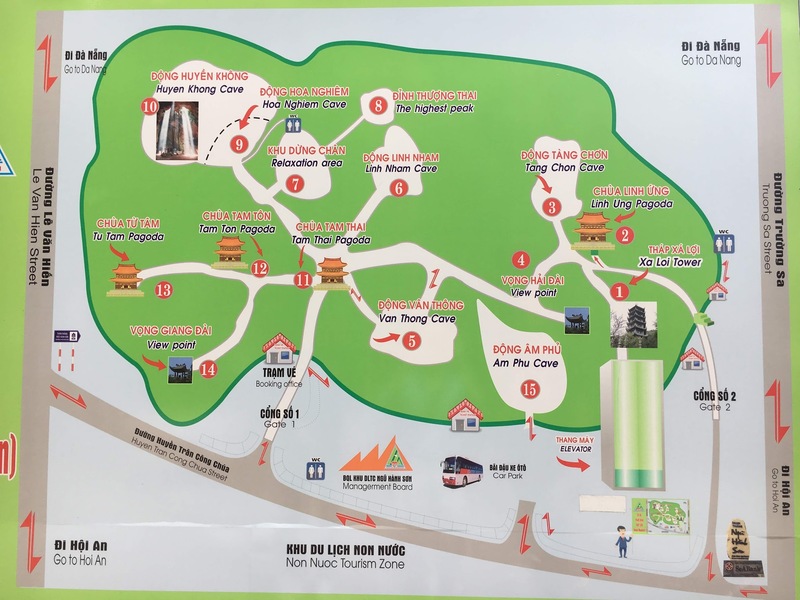 Located on 52 Huyen Tran Cong Chua street, which is very close to Non Nuoc Beach, the mountains are easy to reach by bikes in 30 minutes, or by taxis, and motorbikes in 15 minutes. Entrance fee to Water Mountain is 40.000VND (US$ 2.00). Elevator fee (optional): 15.000VND (US$ 0.75). If the weather is very hot, we recommend you using the elevator services so that your energy is not drained down due to the heat. Entrance fee to Hell Cave for 40.000VND (US$ 2.00). 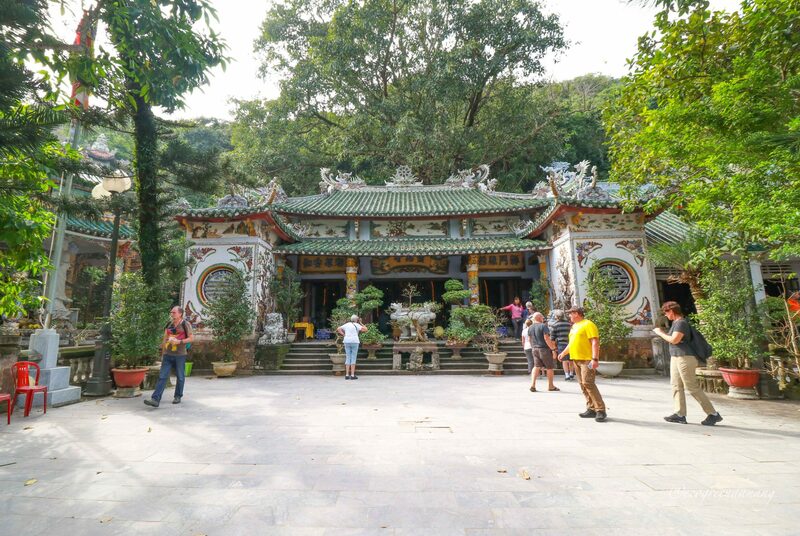 The best time to visit the Marble Mountains is in the spring season from February to May, and in the summer season from June to September. In the spring, the weather is dry with a very nice temperature around 25 – 26 °C, blue skies and a cool breeze. In the summer, the temperature ranges from 30 – 36 °C, which might make you feel hesitated to do mountain hiking. However, in the early morning from 7:00 – 9:00 and in the late afternoon from 16:00, the temperature is lower, which makes your hikes much more relaxing. To prepare for the trip, make sure that you have enough water for hydration, comfortable clothes, hiking shoes. Do remember that the opening hours is 7:00 AM – 5:30 PM daily. From the end of October to the end of November, the Marble Mountains is not in its ideal condition due to the rainy weather. 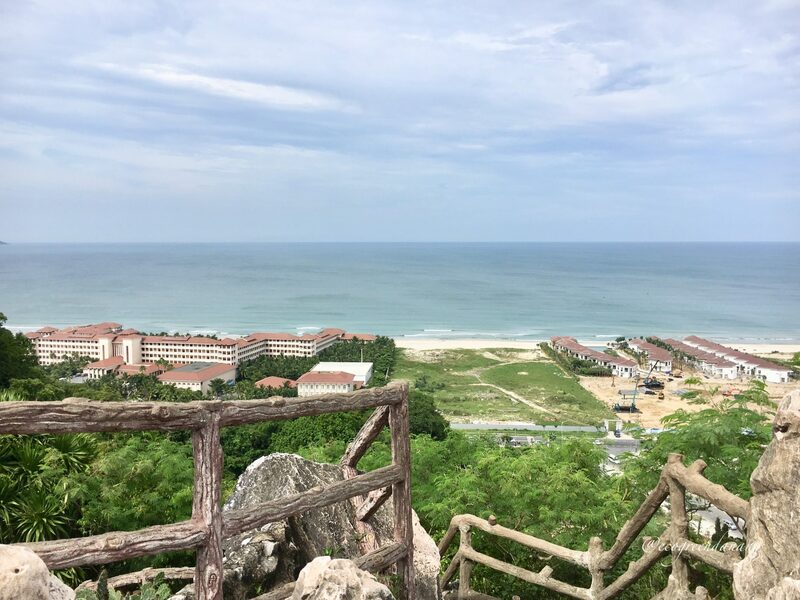 We have a spring day hiking on top of the Marble Mountain and enjoying the magnificent view of the blue ocean. 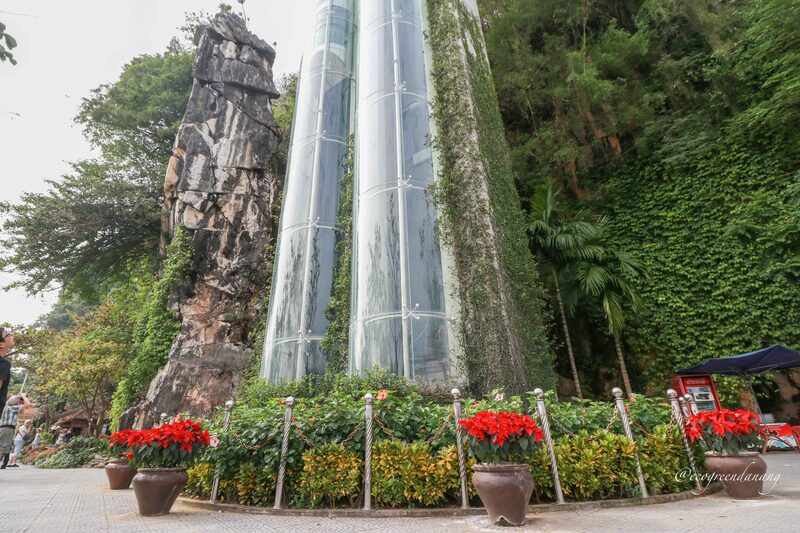 When you arrive at the Marble Mountains, there are two options for you: either to hike up by taking the stairs, or to take the elevator situated in Gate 2. To explore every spot in the Marble Mountains, you would need approximately two hours. Here is a map to navigate around the Marble Mountains. The elevator is located in Gate 2. If you decide to take the elevator, you will be taken to Xa Loi Tower. Once you get out of the elevator, you will see a beautiful view of the Non Nuoc Beach and the mountains surrounded by the local neighborhoods. The tower is 28 meters high, has 7 floors and 6 sides. The tower represents the core values of Buddhism. For example, the 7 floors represent the 7 types of human emotions, including happiness, anger, love, resentment, greediness, hatred, and delusion. The 6 sides represent the 6 senses: vision, hearing, taste, smell, touch, and perception. 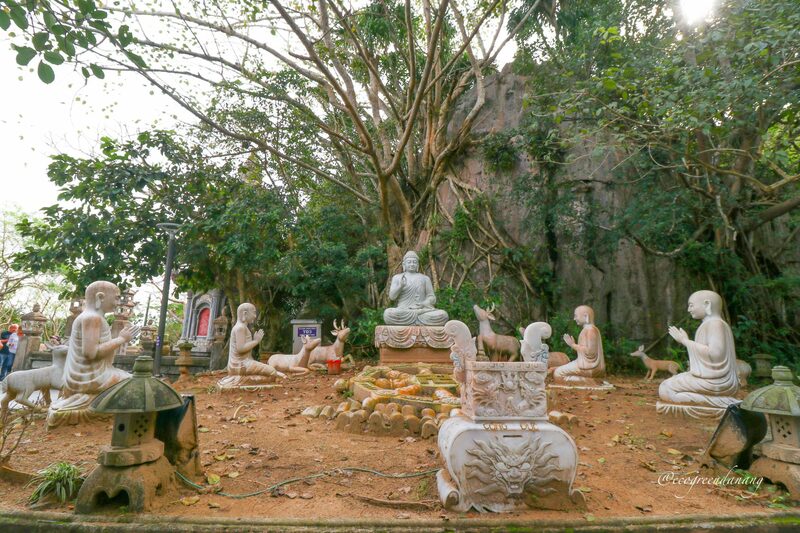 Inside and outside the tower, there are more than 200 Buddha statues. Linh Ung Pagoda is below Xa Loi Tower once you take a few stairs down. The pagoda has a long history from the Gia Long king era around the 17th century; hence, the pagoda is already hundreds of years old. The pagoda is a sanctuary of Buddha statues and golden plates inscribing the King’s demand to name the pagoda. Local people usually show their gratitude in front of the Buddha statues by kneeling, bowing, and meditating. 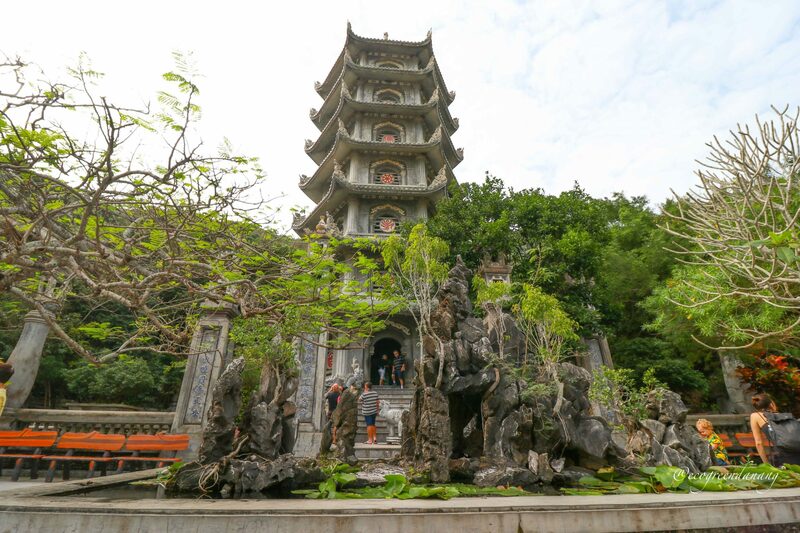 What we find most lovely about Linh Ung Pagoda is the ambience that balances between religion, history, nature, and people. 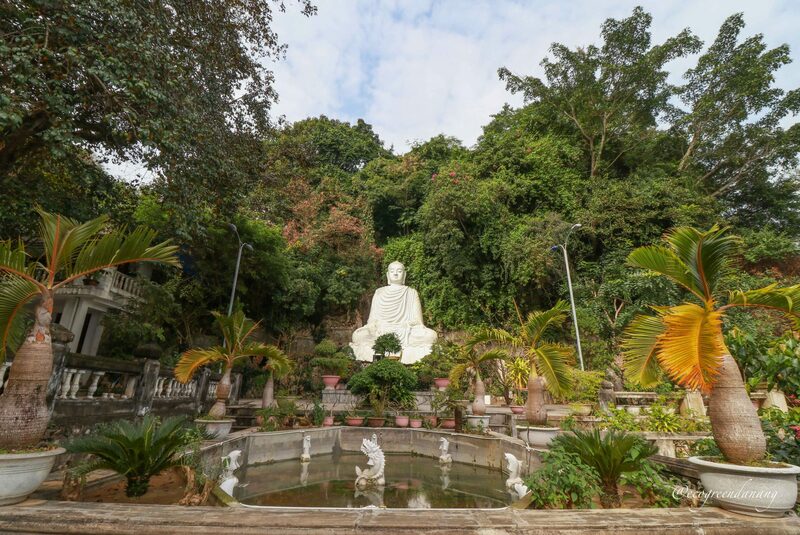 Outside Linh Ung Pagoda, a momentous Buddha statue is situated in a botanical garden. The meaning of “Tang Chon” is a place that contains all the truths of the universe. The cave has a small valley that is about 10m long, 7m wide. The cave ceiling is open towards the sky, which facilitates the circulation of the wind and brings down the temperature. Inside there is a shrine to worship gods that bring happiness and luck to people. 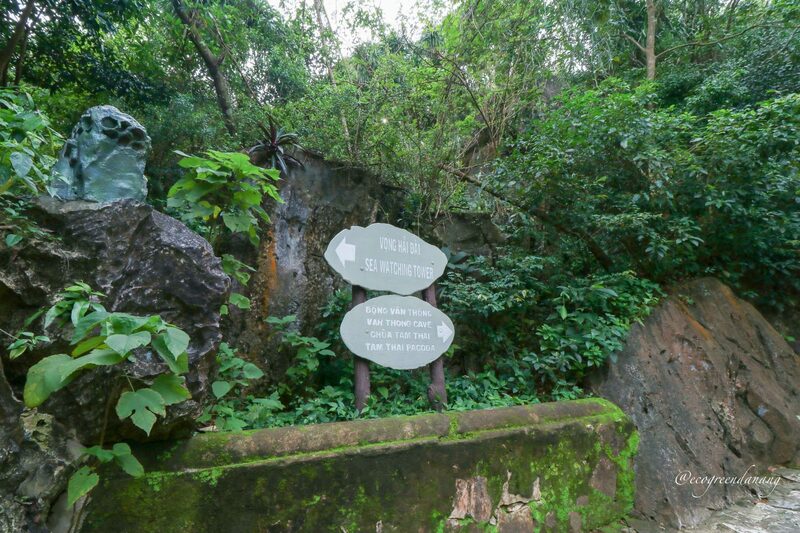 To reach Hải Đài Tower, you can walk to the south from Tang Chon Cave. 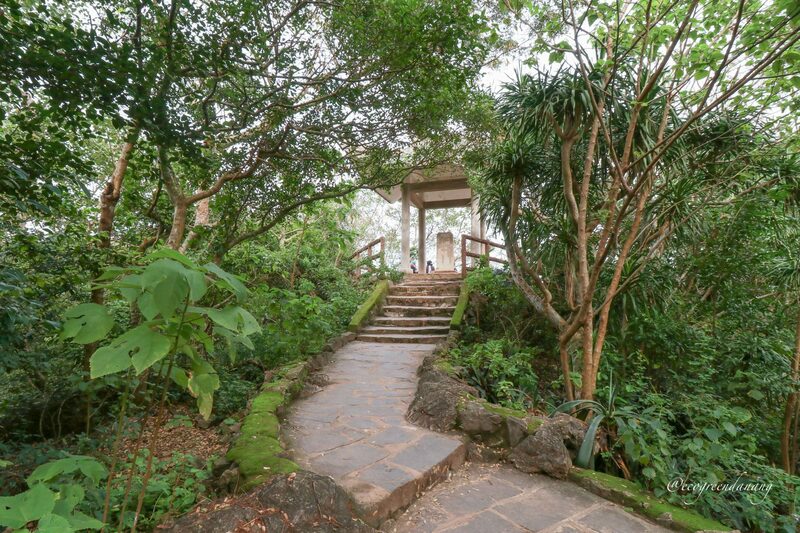 When you discover the tower, you might feel like you have found a magical hidden spot in the middle of the mountain. 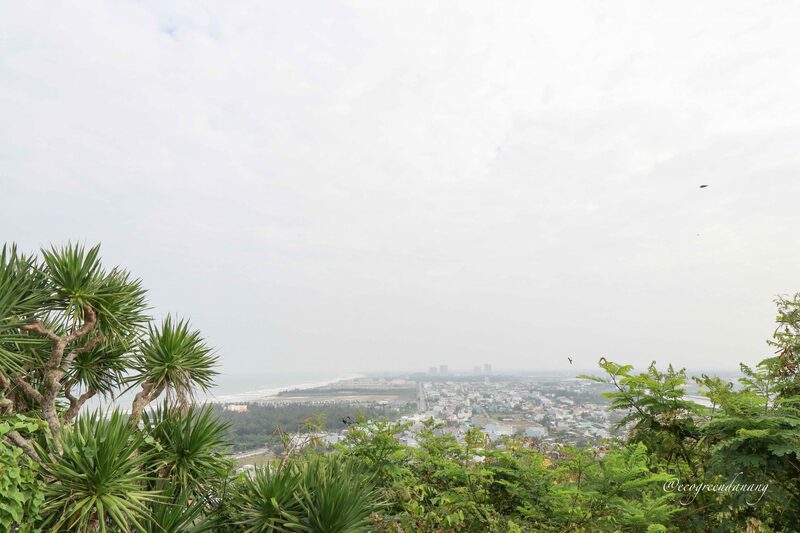 The view from Sea Watching Tower is magnificent as the tower is located up high, where you can see the city, Non Nuoc beach and Cu Lao Cham in a picture frame made of natural trees. The view from Sea Watching Tower is magnificent as the tower is located up high. 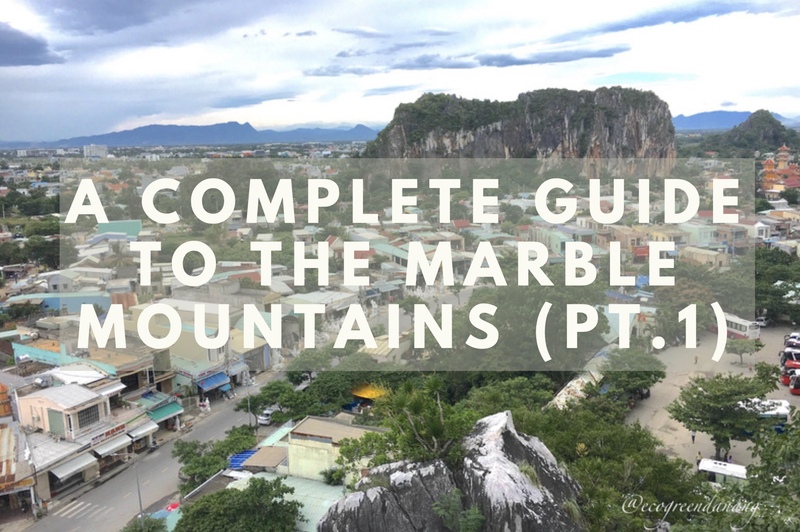 The first part of a complete guide to visit the Marble Mountains will end here. We, Eco Green Travel Team, hope that our local knowledge inspires you to visit this beautiful mountain. 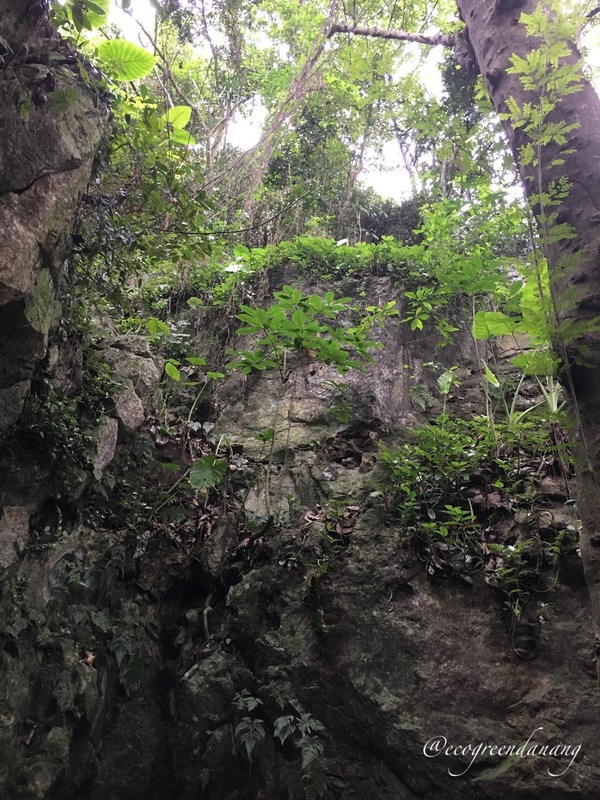 There are many interesting aspects about Marble Mountain that we will introduce in A Complete Guide to Marble Mountains (Pt.2). Stay tuned for the upcoming blog!